If you’ve ever visited us on a Saturday afternoon, and been disappointed not to find Philip sitting behind the reception desk, then here’s a little secret. It’s quite possible that he’s out running with the group in this post. The Hash House Harriers initially started out as a way for Malaysian Rubber Planters to run off the excess of eating and drinking in Malaya in the late 1930’s. It has since proliferated and there are now over 15,000 HHH clubs around the world including several in the Caribbean. What do you need to know about the Grenada Hash House Harriers? Grenada has one that is now considered part of the local culture. Approximately 200 people meet each week on a Saturday afternoon to take on another trail that will have been planned and organised for up to a month before the day itself. As they start off, the hashers can decide to take the walking route which will take about 60 minutes, or the run which will take the best runner 45 minutes or more. It is not a contest, competition is frowned upon. There is no first or last, indeed false trails are cunningly set, to try to slow down the fastest runners! 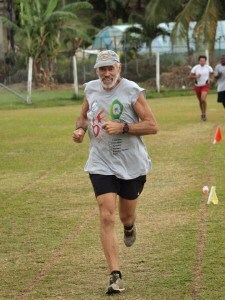 The members of Grenada Hash House Harriers come from all walks of life and from all over the planet. There are local people, students from St George’s University (who send a bus load of participants each week), expats and a whole selection of dogs who also take part. The hashers are also known as “Drinkers with a running problem”! All hashes start and finish at a bar, a different one is chosen each week. There is also a culture of good humour and part of that means that people who attend the event regularly will eventually earn themselves a nickname – including the dogs! Philip has always been a staunch supporter of the club and will travel to wherever the trail is set each week. Along with the other runners, he will follow a trail set by the ‘hares’ and then socialize with a hard earned beer (or three!) once the course has been completed. If you want to go along with him, just bring something suitable for running or walking with you and he will take you with him. You’ll get to see another side of the island that is not always available to the regular tourist. If you want to find out more about their weekly events, you can find them on Facebook. The image is of Philip taking part in the Hash sports day in 2013. Image is courtesy of Brian Steele of the Grenada Hash team.